Heart Shaped Matrix Necklace with 70 LEDs #WearableWednesday « Adafruit Industries – Makers, hackers, artists, designers and engineers! 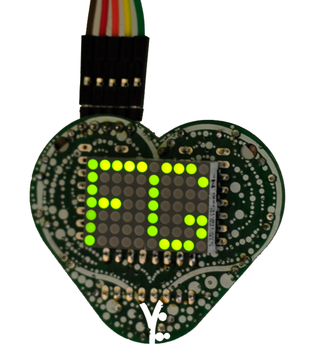 Write messages and show animations on this palm-sized heart-shaped LED display. Works seamlessly with Arduino, and requires only three pins to control. Want a heart matrix of your very own? You can buy this DIY kit for $17.95 on the product page. How does it work? Three shift registers control two LED matrices, each with 35 LEDs. To make it light up requires connecting power and ground, and the 3 wires to speak the shift register protocol (data, clock, and latch). Need to learn more about shift registers before you try this? Check out our shift register tutorial. You’ll need an Arduino or another micro-controller to write messages on the heart matrix. We supply Arduino code and an Arduino library below. Are you ready to build your Heart Matrix? Jump to the step-by-step instructions. We have a ton of tutorials showings fun projects you can do with your Heart Matrix! Make a sound-sensitive necklace, or connect it to twitter, or control the LED display wirelessly with an XBEE, or turn the Heart Matrix into a real time alarm clock. The Arduino library we supply gives direct access to each of the LEDs so the possibilities are endless! Don’t have an Arduino? No worries, we developed the Heartduino, it is a standalone Heart Matrix, built on top of a heart-shaped Arduino clone.